Tumbledown Trivet -- A free Crochet pattern from Julie A Bolduc. 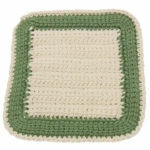 This crocheted trivet has a CD inside but you could just as easily keep the CD out of it to make it into a potholder. This trivet is named for a mountain here in Maine.